The battle begins. The Microsoft Surface RT was the first device that introduced the world to the newest version of Windows and the first one to run on the ARM architecture. 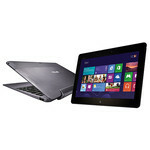 Asus is well known in the industry to make the best quality tablets other than Apple. Asus is hoping this to be another feather in their cap. Microsoft pointed the way for the other tablet manufacturers with the Surface RT and clearly shows just what is possible with the new Windows RT operating system. It is now up to the engineers and product designers from the innumerable device manufacturers to make something out of the specifications and adopt the operating system to their own tablets. Asus sticks to its hitherto successful concept of a tablet and optional keyboard dock hybrid. The final result comes very close to the Surface RT in terms of looks. Not many modifications have been made to the hardware components. Asus also employs Nvidia's Tegra 3 quad-core processor with a clock rate of 1.3 GHz. The VivoTab RT 2 has 2 GB of DDR3 working memory and a 10.1 inch IPS screen with a resolution of 1366 x 768 pixels. Our test model sports 64 GB flash memory and is available for 599 Euros (~$790). A keyboard dock can be bought optionally for an additional 130 Euros (~$170). 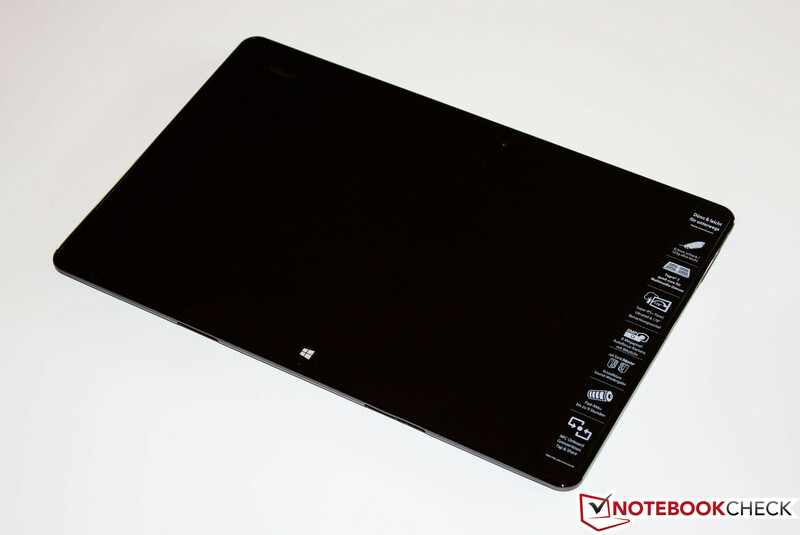 Like in the Surface RT, a VivoTab RT version featuring Windows 8 Pro is in production. 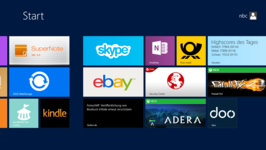 The full version of Windows does not need an app store to install additional apps on the tablet. Instead it uses the compatible software available on the market. Whether Asus has managed to iron out the weaknesses of Microsoft's Surface RT and offer an even superior device can be discovered in the following review. 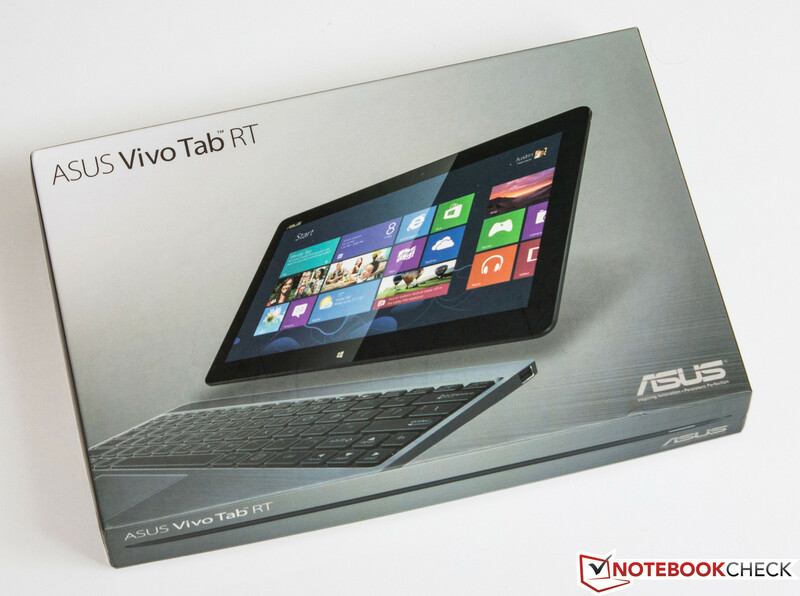 The first contact with Asus' VivoTab RT immediately conveys high-end build. The screen is bordered by a plastic bezel featuring a piano paint finish. This frame is fitted on the back cover that is largely made of metal. The back's lower 75% is comprised of brushed aluminum and adds to the stability and quality. The upper part is made of plastic. Modules like Wi-Fi, Bluetooth, GPS and NFC (Near Field Communication) are likely concealed beneath this for transmission-related reasons. The different materials and components have a total weight of 525 grams. The tablet's rounded back cover is ergonomic to hold but using it with one hand gets arduous after a while. 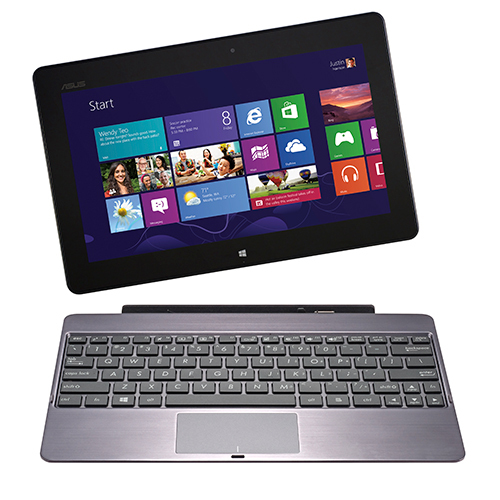 Asus has the Android-based counterpart of the VivoTab RT, dubbed the Transformer Pad Infinity TF700T in its range. It did an extraordinary good job in our review. Its size impressed us among other things. Asus improved on, or rather "reduced" the size of the VivoTab RT. The new Windows RT flagship is quite a bit smaller, thinner and lighter. With a size of 262.5 x 170.9 x 8.3 mm, it can literally hide itself behind both the Transformer Pad Infinity TF7000T and Microsoft's Surface RT. The slimness reduces the torsional stiffness and the casing yields under the slightest force. The primary camera and its flash are installed in the back cover's plastic part. The front-facing camera does not feature flash. Two large recesses are found on the casing's lower edge. They connect the tablet with the optional keyboard and this connection is pretty stable. The hardware is very similar to that of the recently reviewed Microsoft Surface RT. The long-known Nvidia Tegra 3 quad-core with a clock speed of 1.3 GHz is used as the SoC. Two GB of DDR3 working memory and 64 GB flash memory supports it. When thinking about buying a Windows RT based tablet, the memory capacity should be considered carefully when choosing a model. Our test model features a total memory of 64 GB, but the drive is pre-partitioned. Three of the four partitions are hidden system and recovery partitions and the user cannot use them productively. The remaining partition has a capacity of 54.08 GB. 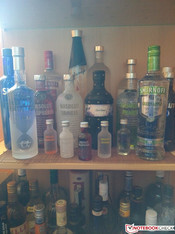 If you now think that the memory is still generously sized, you are wrong. Windows RT needs approximately 14 GB for the installation files and consequently less than 40 GB are left for personal data. If that is not enough, it is possible to use the micro SD slot and upgrade the memory with a SDXC memory card. Asus makes cutbacks in connectivity. The very important USB port for Windows is only available via the optional docking station. Due to the tablet's low profile, it was not possible to install it here. However, Asus includes an adapter if you do not have the docking keyboard and do not want to waive on a standard USB port. 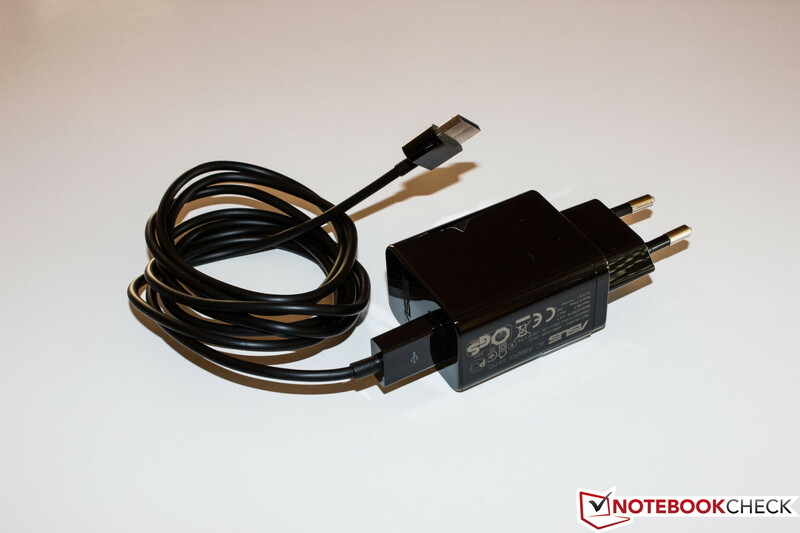 It is plugged into the tablet's bottom and uses the same port as the proprietary charging cord. We would sooner see this as a situation-related makeshift solution than a permanent one. The construction is approximately 5.5 cm long and loose-fitting when the adapter is connected to a conventional USB cord. We do not want to imagine what might happen in an unheeded moment. The slider for releasing the keyboard dock is located on the device's lower left side. The micro SD slot (SDXC compatible) and a micro HDMI port are above that. We noticed that the volume control's pressure point for the button for lowering the volume was much more accurate than its counterpart. Nvidia's Tegra 3 SoC already indicates that the VivoTab RT is based on the ARM optimized operating system, Windows RT. This should not be confused with Windows 8 that comes preinstalled on new x86 laptops. 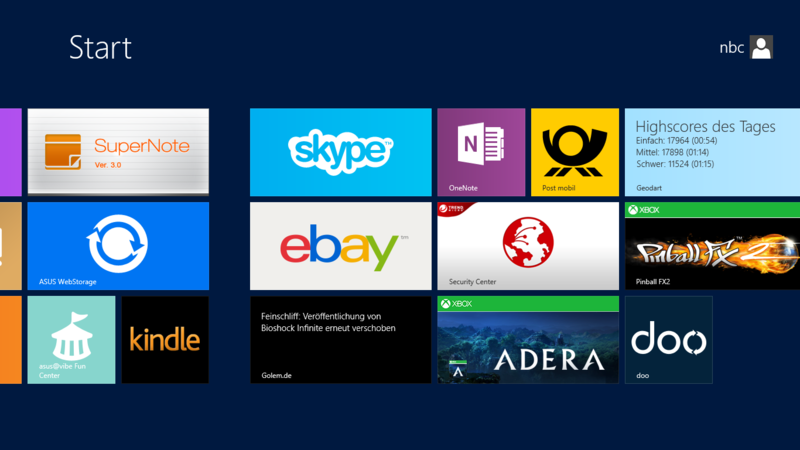 Although the looks and feel do not differ from the "full-fledged" Windows 8 edition, the RT version exhibits a significant difference under the hood. Software is only available in form of apps from Microsoft's Store and the current assortment is still limited. Windows RT incorporates the much loved features of Windows 7 as well as some of the new features introduced in this iteration of Windows. Users who have only had experience with Windows 7 and now changed to Windows RT will initially find operation via a tile interface surprising. The desktop mode also exists beside the tile interface. The Windows user will feel comfortable here because it seems to be setup like former Windows versions and can also be used perfectly and precisely with a finger. A mail program and the local as well as cloud-based Office Home & Student 2013 RT come preinstalled. Windows even offers a free upgrade to the full Office version as soon as it is available. The bundle is complete after Asus adds a bit of bloatware. If you are not yet using a cloud service, you can use "Asus WebStorage" for three years free of charge or try the "[email protected] Vibe Fun Center". The manufacturer also adds the "Asus Camera" app in addition to the preinstalled camera app. However, we did not immediately find the added value of this app. 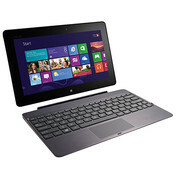 Very important for Windows-based devices is the compatibility with other hardware. Nowadays, no one wants to have to tediously install drivers for every USB device like it was still common during the reign of Windows 98. Plug and play - that's the way we want it. 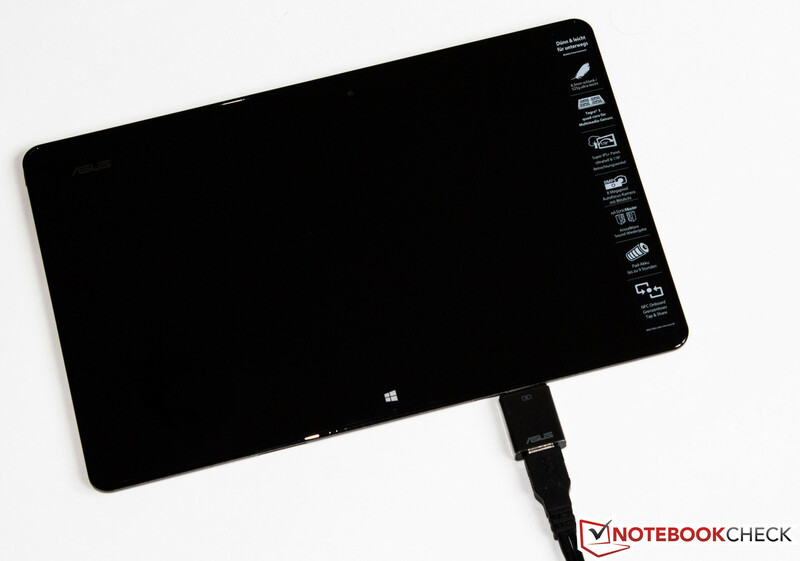 We tested this on the VivoTab RT and did not have problems with almost any of the peripherals. External hard disks, flash drives, mice and keyboards largely worked right away. The VivoTab RT only did not get along with our keyboard-mouse set from Trust even after several attempts. But that was apparently an exception. 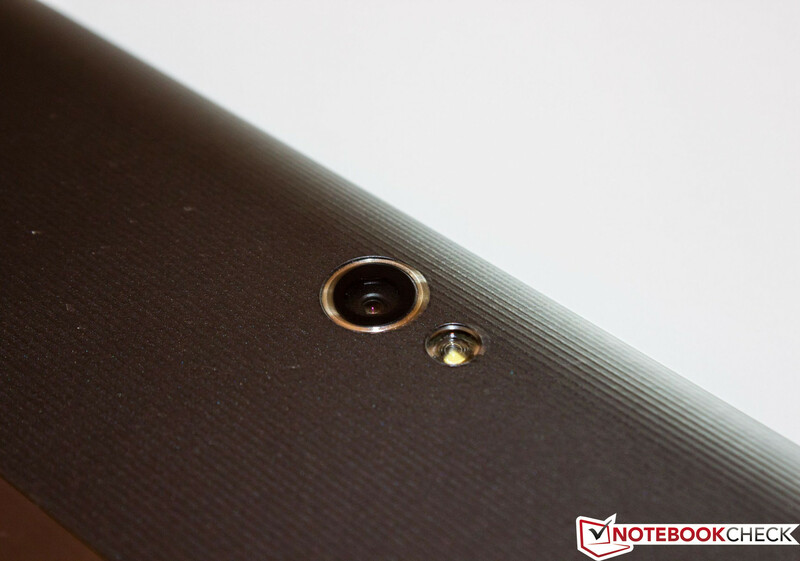 The VivoTab RT sports two microphone openings for video chats on the casing's upper side. We assume that the wireless modules are underneath the plastic cover at the rear. Asus equips the tablet with the latest Bluetooth 4.0 standard. This is a bit different with the Wi-Fi module. Like Microsoft's Surface RT, the VivoTab RT transmits in the 2.4 GHz spectrum but regrettably not in the broader and stronger 5 GHz band. Connections via Bluetooth and Wi-Fi worked immediately in the test and we did not observe any unexpected interruptions. In contrast to the Surface RT, it is quite possible to transfer files via Bluetooth. Asus installed the GPS receiver that the Surface RT does not feature. It also worked stably, accurately and reliably in connection with Google Maps. So that no confusion arises, we want to mention that the GPS module is dubbed "GNSS" (global navigation satellite system) in the Windows settings. The unit comes with two cameras. Asus equips the rear-facing primary camera with an 8-megapixel sensor and LED flash. The front-facing camera features a 2–megapixel sensor since it is mostly used for video calls, which brings us to a special feature for this device. The front-facing camera takes clean pictures in adequate ambient light which are pretty good for a web camera with these specifications. Both cameras can record videos in Full HD quality. The primary camera's quality is satisfactory in sufficient ambient light. 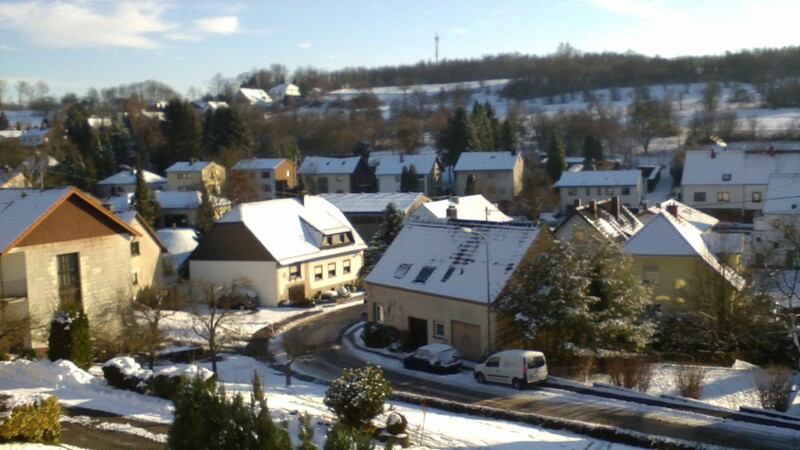 However, we noticed an overexposure in a direct comparison with our reference camera. In our opinion, the primary camera's small sensor could have caused the poor color reproduction in images. The front-facing camera should mainly be used for video calls because the picture quality neither satisfied us indoors or outdoors. 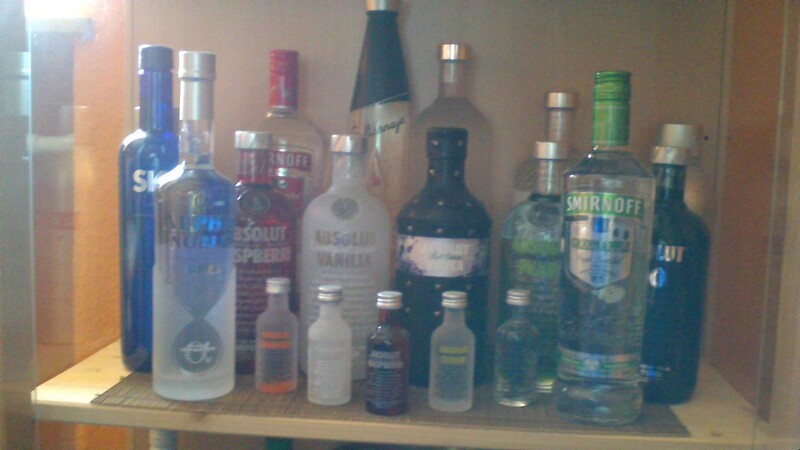 In both scenarios, the lack focus and a clear image noise is seen on pictures made indoors under moderate lighting. The primary camera reproduces the motifs better, but also struggles with evolving noise in dimly lit surroundings. As to accessories, the manufacturers are usually not really open-handed. Asus at least includes a microfiber glove to remove annoying fingerprints from the screen. This is justified as the device magically attracts fingerprints. 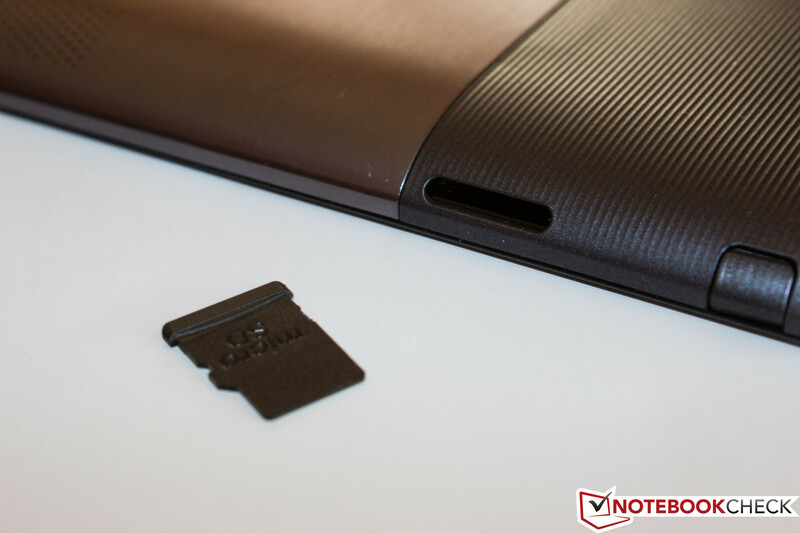 The low height of 8.3 mm prevents installing a USB port in the tablet which will upset many potential buyers. As a consolation, a USB adapter, which is plugged into the proprietary charging port, is included. Other accessories have to be acquired via third-party sellers. A fold-out stand like for Microsoft's Surface is certainly a sensible accessory if you do not have the keyboard. 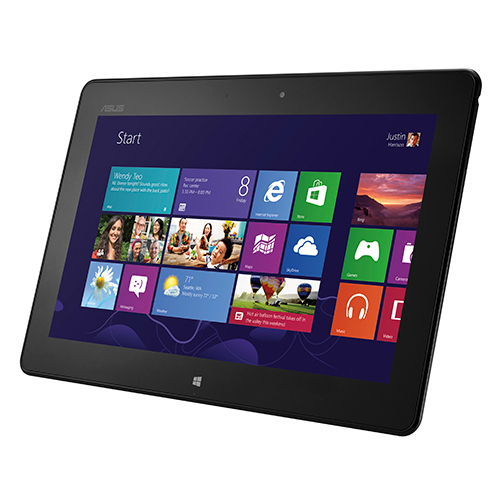 Asus includes a 24 month warranty on the VivoTab range. Like in all tablets, the main control feature is touchscreen input. And it unsurprisingly works perfectly. The screen responds accurately to inputs and implements them in a blink of an eye. Hitting the tiles is of course no problem because they are mostly implemented under consideration of the tablet's special controls and feature a sufficient size. The handling in desktop mode surprised us. The smallest icons or directories were accurately selected and the intended operation was almost always executed - although the icons are only a few millimeters in size. Sensors are also incorporated in the four edges to implement the necessary system navigations. When swiping from the top to the lower edge in an app, it is closed. Moving the finger from the left edge a bit over the screen retrieves the prior application. Every edge has at least one gesture. After a short period, the user will be familiar with all necessary gestures and will confidently navigate through Windows RT. Our test device unfortunately did not include the optional keyboard. However, we have often had a tablet keyboard from Asus and assume the quality will be equal to that of Asus Transformer Pad Infinity TF700T. Looking at this promotion from Asus might be worthwhile if you want to buy the tablet without the keyboard. Asus installs a capacitive "178°" wide viewing angle IPS screen in the VivoTab RT. The screen size is 10.1 inches and features a resolution of 1366 x 768 pixels. 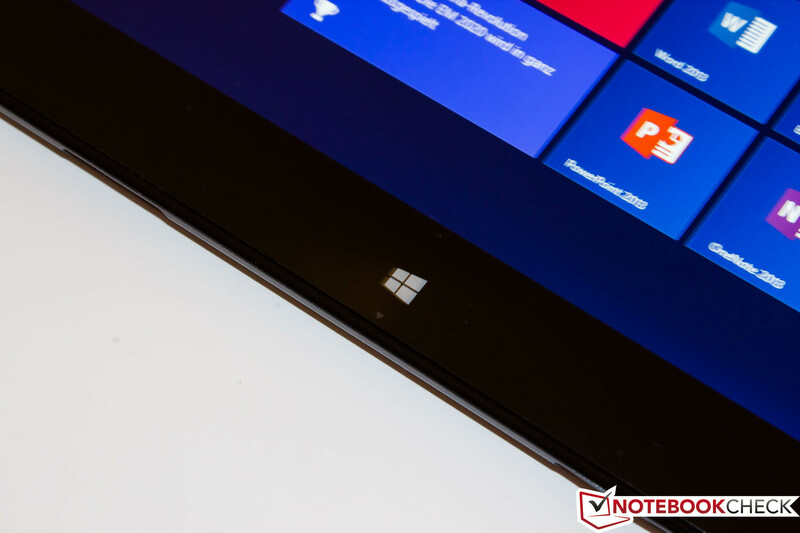 Compared with the somewhat larger screen in Microsoft's Surface RT (148 ppi), the VivoTab RT has a higher pixel density (155 ppi). Both tablets rely on an aspect ratio of 16:9. 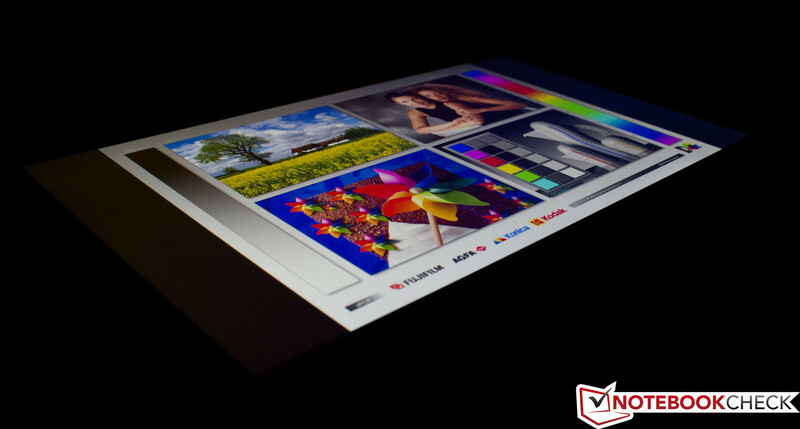 Another core competency of the VivoTab RT is the bright screen with an average brightness of 424.6 cd/m² with an illumination of 85%. Microsoft's Surface RT is again defeated due to a lower average of almost 100 cd/m². We measured up to 456 cd/m² in the upper center. Although the upper six measuring fields achieved very good brightness rates, the lower areas were a bit weaker. This big difference of approximately 50 cd/m² is however not noticed in routine use. The ascertained black value of 0.52 cd/m² (Surface RT: 0.33 cd/m²) results in a contrast of 869:1 (Surface RT: 1079:1). The glare-type screen reflects sunlight intensely and the tablet also attracts fingerprints. Both factors are major drawbacks when the tablet is to be used outdoors. The high contrast and the screen's very good brightness largely compensate the aforementioned shortcomings and allow for outdoor use. As the promoting text on the manufacturer's homepage hints, content can still be read even at extreme viewing angles of up to 178°. We doubt whether it is exactly 178°, but the IPS screen meets the expectations of high viewing angle stability and color fidelity while maintaining the contrast consistently high. Nvidia's well-known Tegra 3 quad-core SoC with a clock rate of 1.3 GHz (100 MHz less than in Microsoft's Surface RT) is the engine under the hood. 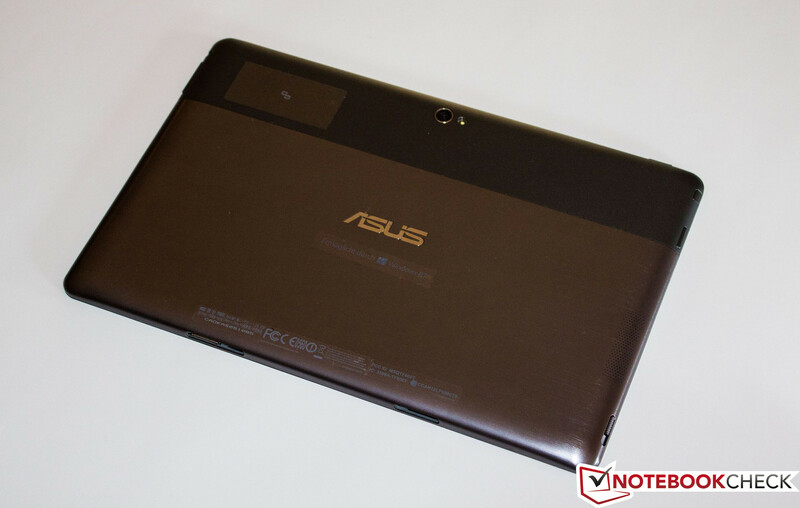 As appropriate for high-end devices, Asus equips the tablet with 2 GB of DDR3 working memory. This SoC is installed in Asus' Transformer Pad Infinity as well as various smartphones and can therefore be used for comparison. The problem here is that there are no synthetic benchmarks yet available in Microsoft's Store for the virginal Windows RT. Futuremark has announced a new, cross-platform 3DMark for the end of this year. 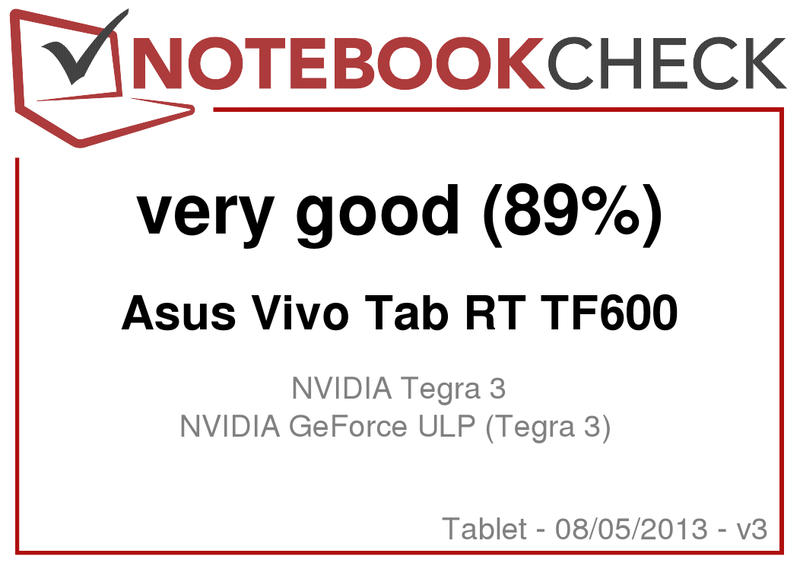 Until then, we can only assess and compare the VivoTab RT's performance using browser-based benchmarks. Since we have data from Microsoft's Surface RT, we did not have any great expectations regarding the variance in the results. 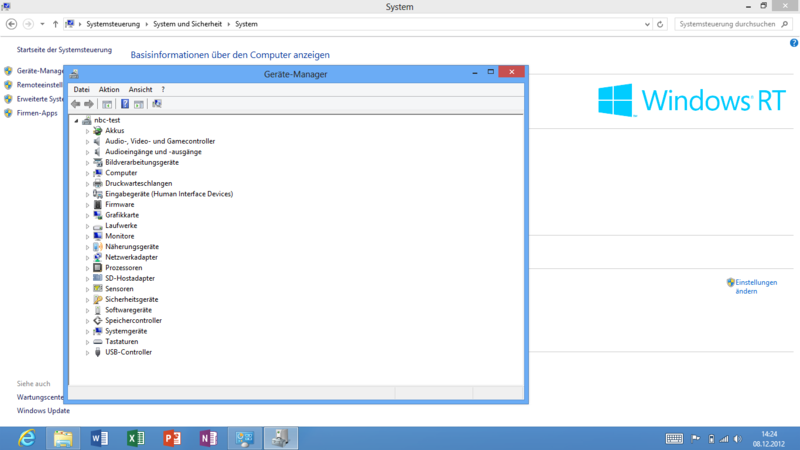 The hardware has hardly been modified and Windows has not released any updates addressing performance to date. The results were a mixed bag. With 745 points in Google's V8 v7, the VivoTab RT is slower than the Surface RT (796 points) and much slower than new Android and iOS devices. Futuremark's Peacekeeper recorded an equally sobering score. 351 point is truly not top performance, especially since even smartphones achieve significantly higher scores. However, the used browser is crucial here and the Windows RT user will presently not get around Internet Explorer 10.0. Sunspider 0.9.1 provides a ray of hope. Even the latest Android devices are up to 100% slower than both the VivoTab RT (1012.9 ms) and the Surface RT (997.5 ms). The Windows devices are only defeated by Apple's iPad 4 (895.3 ms). We have not found an explanation for this yet, but we still believe the operating system and browser are responsible for the results. The ascertained benchmark results don’t translate into any significant negative influence in the user experience. Actually the opposite is true: It sometimes even seems as though the tablet responds very quick and agile while browsing. Loading a website does not take very long and navigating through the Internet is swift. The preinstalled video player renders the trailers tested in Full HD quality without problems. The screen's playback quality is excellent and very well suitable for high definition videos, not least due to its aspect ratio of 16:9. We never noticed any performance bottlenecks. Games are currently just as scarce as apps in Microsoft's Store. We downloaded a selection of available games and tried them out. The 3D game Adera developed by Microsoft features numerous video sequences but is no problem for the VivoTab RT. Consequently, less demanding 2D games, like Pinball FX 2, are not really a challenge. The existing collection of apps does not push the VivoTab RT's SoC to its limits and we presume that the tablet will also have sufficient performance for future game releases. The load temperature reached its maximum of 41 degrees Celsius in the area of the charging port on the back, which was also the only time it surpassed 40 degrees. The VivoTab RT shows good results for such a slim casing and never got alarmingly warm. Microsoft's Surface RT exhibited a slightly cooler temperature level. It was hardly possible to discern both devices just by feeling their temperature when idling. The power supply unit achieved a maximum of 41.2 degrees Celsius. (±) The average temperature for the upper side under maximal load is 33.1 °C / 92 F, compared to the average of 30.7 °C / 87 F for the devices in the class Tablet. (+) The maximum temperature on the upper side is 36.8 °C / 98 F, compared to the average of 34.8 °C / 95 F, ranging from 22.2 to 51.8 °C for the class Tablet. In keeping with the previous impression, both stereo speakers prove to have an above-average quality in comparison with other tablets or smartphones. The maximum volume is more than sufficient, and the playback is clear and pleasant up to a certain level. The sound distorts at maximum volume. The VivoTab RT shows construction-related drawbacks with bass-heavy playback. A 3.5 mm jack is available for enhanced music enjoyment. 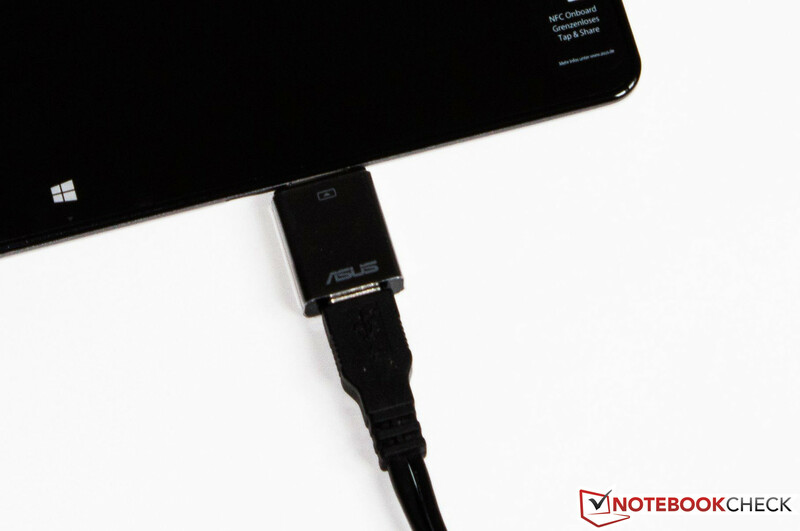 Asus does not include earphones for the VivoTab RT. 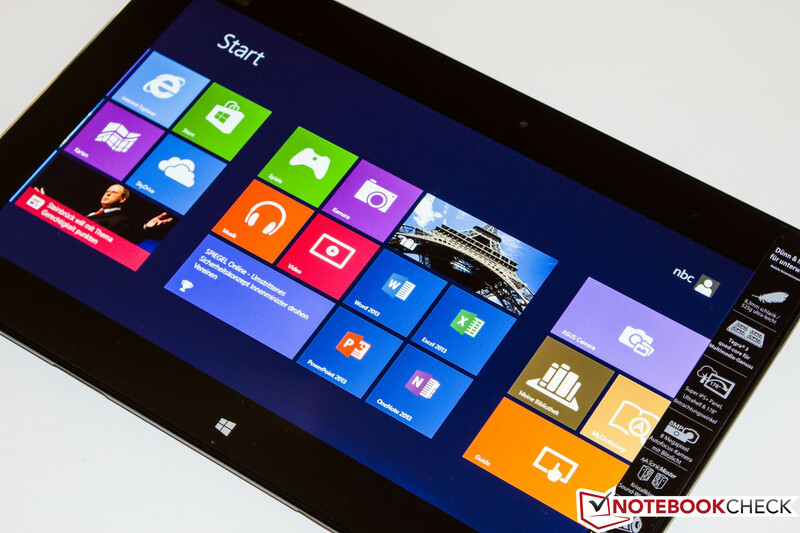 A few differences are noticed between the VivoTab RT and Microsoft's Surface RT in power consumption. We ascertained almost identical results due to the similar hardware and the same operating system. Nevertheless, the VivoTab RT is slightly inferior to the Surface RT's power consumption in the load scenario. It consumed between 9.1 and 11 watts during load, wherethe rival from Redmond only required between 7.6 and 10.6 watts. 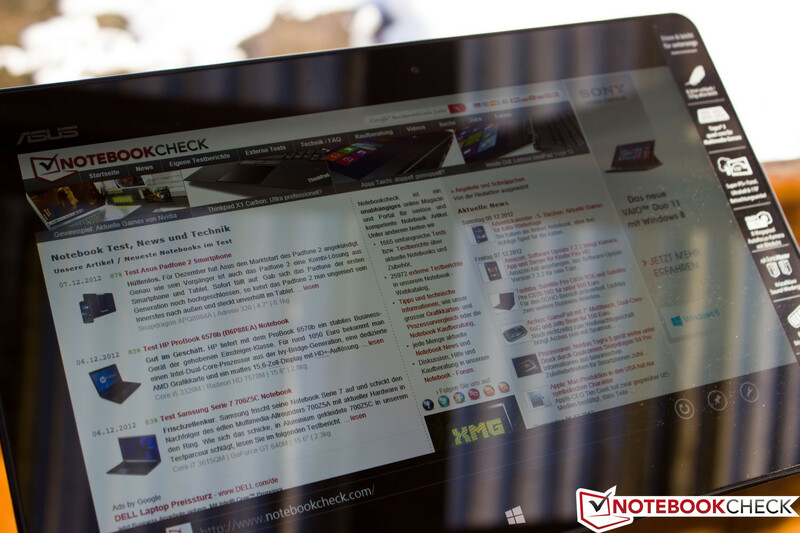 We believe this difference is caused by the VivoTab RT's brighter screen. The screen brightness of both samples was reduced to minimum for the idle time measurement. Consequently, we ascertained almost identical rates of energy consumption. Our test device had a power draw form 2.8 to 6.1 watts, while the Surface RT needed 3 to 6.2 watts. The tablet does not consume any power when it is turned off and 1.4 watts in standby mode is all we measured. A 25 Wh, non-removable lithium polymer battery is installed in the tablet. 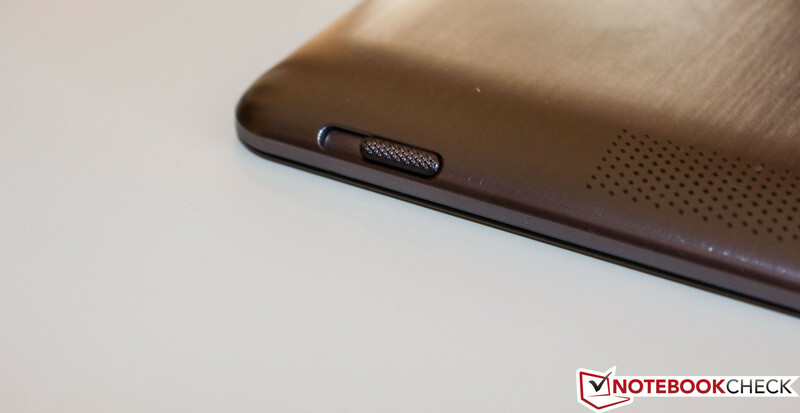 In the realistic "surfing via Wi-Fi" test, the VivoTab RT convinced with a runtime of 10 hours and 18 minutes which is an excellent figure. The tablet from Redmond already exhibited a remarkable time, but could not achieve this excellent result (difference: 102 minutes). The lithium polymer battery lasted for 16 hours and 10 minutes when the screen's brightness was set to minimum and we disabled the wireless modules. 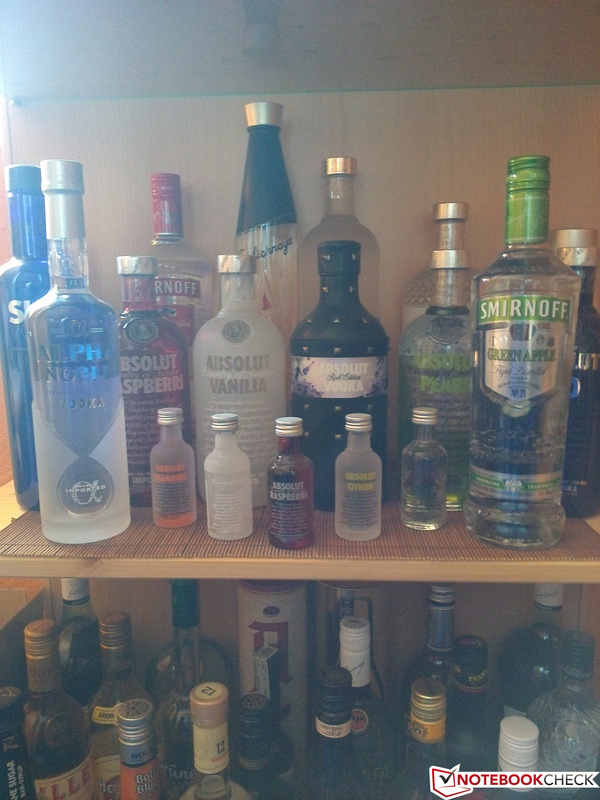 This should be enough to easily survive for a whole work day without an external power source. Should this outstanding battery runtime not be enough, you could think about buying the keyboard dock. The keyboard's built-in lithium polymer battery would add a capacity of 22 Wh to the 25 Wh of the tablet's battery and would almost double the runtime. The charger needs 2 hours and 58 minutes to completely recharge the tablet's battery. The die is cast - Asus shows greatness and scores across the board with its first Windows RT tablet. The device features well-chosen materials of construction, first-rate workmanship and a compact size at an average weight. 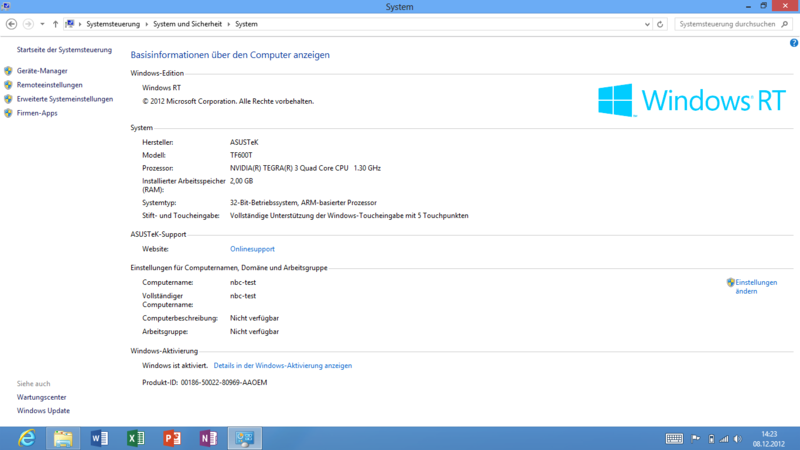 The hardware is from the same one in Microsoft's Surface RT and accordingly achieves similar results. Seen objectively, the VivoTab RT does not excel with its performance in the available benchmarks. However, it becomes clear that you should not completely rely on benchmarks and the results. It is possible to work very smoothly with the tablet. We never noticed performance bottlenecks or had the feeling that we had to unduly wait for an action/input to be implemented. 3D games and Full HD movies are not a problem either. The beautiful IPS screen makes running multimedia applications a joy and the lithium polymer battery ensures a long-lasting VivoTab RT. Our praise ends at this point. A full-sized USB port is almost absolutely essential for Windows. 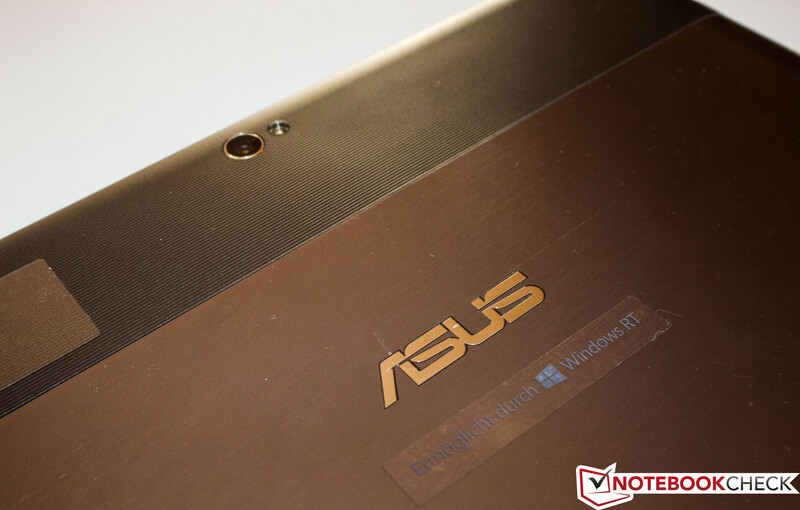 Regrettably, Asus did not manage to install this port into the tablet due to the slim build. The user has to fall back on an adapter when necessary and has to accept a shaky combination, which also greatly restricts mobility. Otherwise, the VivoTab RT sports the usual interfaces and even additionally features a GPS module, unlike the Surface RT. The cameras only provide average results, but have become integral parts of tablets. On the other hand, the speakers are compelling and stand out of the mass of mainstream speakers on similar devices. If Android or iOS tablets lacked something, then this might be the tablet for you. The new Windows RT devices usually blend into an existing PC environment very well and provide many advantages in contrast to other devices. 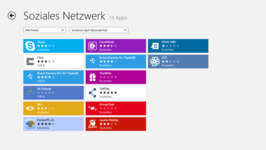 When Microsoft minds its store just as well as Google has done with its Play Store or Apple with its App Store, the buyer would be satisfied with a vast collection of apps from the Microsoft Store for Windows RT devices. Asus has perfectly implemented the Windows RT tablet's concept with a decent hardware selection and sells the end product mentioned in our review for 599 Euros. 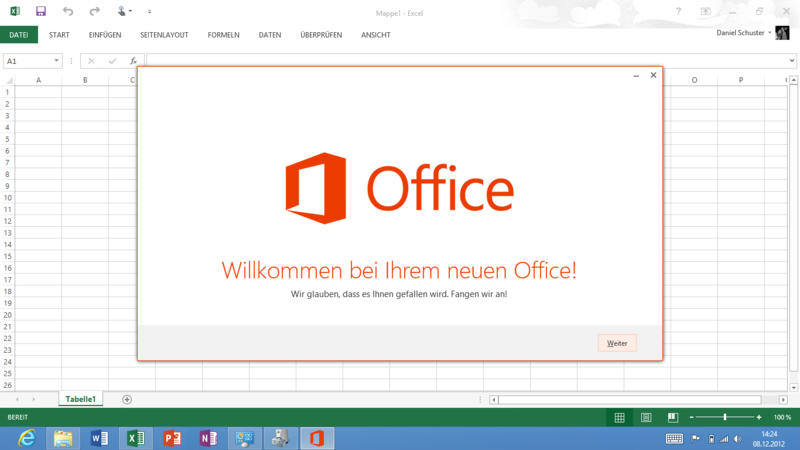 Preinstalled free version with option of upgrading to the full version: Office 2013. Software compatibility might be the major difference. The screen stays legible outdoors. The Windows icon is comparable with Android's Home button. for navigating through Windows RT. The primary camera has a sensor of 8 megapixels. just like the power button and volume rocker. The rear is partly plastic and partly metal. Keyboard lock on the casing's left. is also available with an optional keyboard dock. 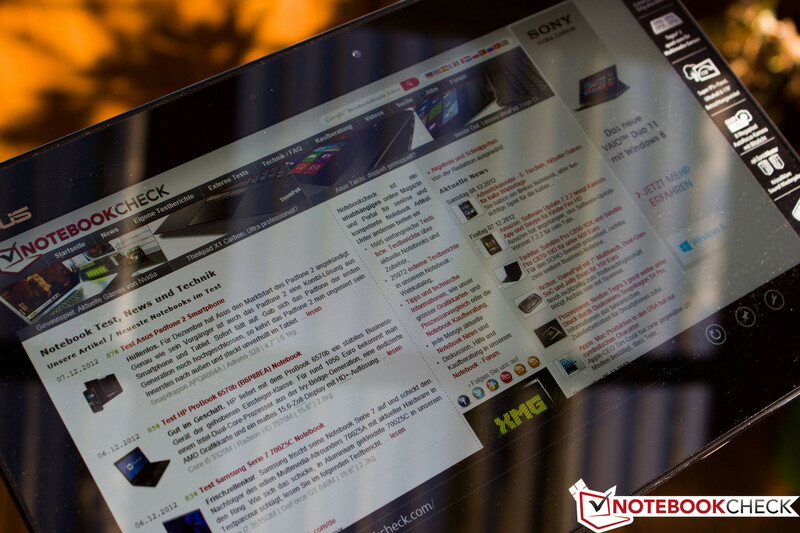 The Asus VivoTab RT convinces from the beginning to the end. The maximum brightness enables outdoor use. The tablet mutates to a permanent companion due to its robust build and size. The touchscreen's accuracy even with the tiny Windows icons is brilliant.